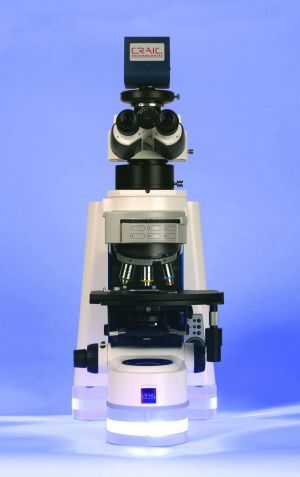 UV-visible-NIR and Raman analysis of microscopic sample areas. Leading technologies to yield superior results. Many types of spectroscopy on a single platform. Let CRAIC Technologies help you succeed. San Dimas, CA (January 17, 2018) – CRAIC Technologies, the world leading innovator of microspectroscopy solutions, has added Raman microspectroscopy to its flagship product: the 20/30 Perfect Vision™ microspectrophotometer . Users of the 20/30 PV™ now have the ability to acquire Raman spectra by integrating the new Apollo II™ Raman microspectrometer with the 20/30 PV™. Together, these two systems offer multiple laser wavelengths, in addition to UV-visible-NIR absorbance, reflectance, fluorescence and emission microspectra™. The 20/30 PV™ is able to acquire all these types of spectra micron scale samples rapidly and easily. 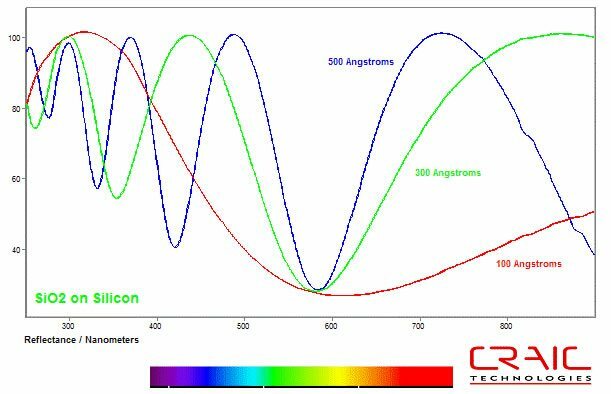 Better yet, the 20/30 PV™ is able to acquire all these spectra from the same area because it features CRAIC Technologies proprietary optical aperturing technology. Additionally, the 20/30 PV™ features the ability to acquire images of these same microscopic samples in the UV, visible and NIR regions. The applications for such a multi-purpose instrument are numerous. 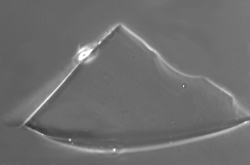 For example, the 20/30 PV™ is used to develop the latest advanced materials, such as graphene and carbon nanotubes, to studying various types of biological samples, including lignins and nanocrystalline cellulose, to the analysis of forensic samples and the measurement of thin film thickness in the semiconductor industry. Giving this instrument the ability to analyze the Raman spectra of microscopic samples in addition to UV-visible-NIR and fluorescence microspectroscopy makes the 20/30 PV™ the cutting-edge micro-analysis tool for any laboratory or manufacturing facility. The 20/30 PV™ microspectrophotometer is a self-contained unit that features advanced UV-visible-NIR light sources, solid state lasers, true UV-visible-NIR microscopy, sensitive Lightblades™ spectrometers and sophisticated Lambdafire™ spectral and imaging software. 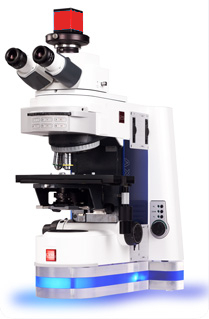 Raman microspectroscopy is added with the Apollo™ Raman microspectroscopy packages. The Apollo II™ is a self contained package including laser, spectrometer and hardware that is integrated with the cutting-edge 20/30 PV™ microspectrophotometer, giving you multiple methods to analyze microscopic samples rapidly and easily. 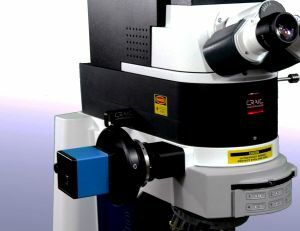 With its Raman, UV-visible-NIR spectroscopic and imaging capabilities, durable design, ease-of-use and the experience of CRAIC Technologies in microanalysis, the 20/30™ microspectrophotometer is more than just a scientific instrument…it is a solution to your most challenging analytical questions. 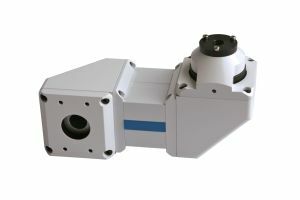 For more information about the 20/30 Perfect Vision™ microspectrophotometer and the Apollo II Raman microspectrometer, visit http://www.microspectra.com. 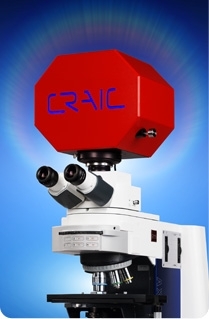 About CRAIC Technologies: CRAIC Technologies, Inc. is a global technology leader focused on innovations for microscopy and microspectroscopy in the ultraviolet, visible and near-infrared regions. CRAIC Technologies creates cutting-edge solutions, with the very best in customer support, by listening to our customers and implementing solutions that integrate operational excellence and technology expertise. CRAIC Technologies provides answers for customers in forensic sciences, biotechnology, semiconductor, geology, nanotechnology and materials science markets who demand quality, accuracy, precision, speed and the best in customer support. A UV-visible-NIR spectrophotometer, such as used in CRAIC Technologies microspectrophotometers, measures the intensity of electromagnetic energy wavelength by wavelength. The spectrophotometer is an optical instrument for measuring the intensity of light relative to wavelength. Electromagnetic energy, collected from the sample, enters the device through the aperture (yellow line) and is separated into its component wavelengths by the holographic grating. Simply put, the grating acts to separate each color from the white light. The separated light is then focused onto a CCD array detector where the intensity of each wavelength (or each color if in the visible region) is then measured by a pixel of the array. The CCD is then read-off to a computer and the result is a spectrum which displays the intensity of each wavelength of light. An example would be a spectral measurement of the visible range which we perceive of as color. White light would enter the monochromator and be separated into a rainbow of each color. This rainbow, with blue light on one end and red on the other, would be focused on to the CCD. Each pixel of the CCD would then measure the intensity of a color. The results would be a spectrum such as the one shown below. 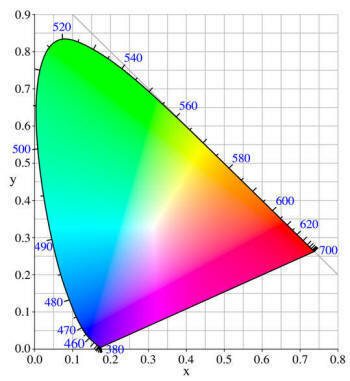 As shown, the blue pixels emit blue light, the green pixels emit in the green portion of the spectrum and the red pixels emit red light. CRAIC Technologies builds microspectrophotometers. These devices integrate the spectrophotometer with a microscope to enable one to measure the spectra but of microscopic sample areas. Microspectrophotometers are also used to measure fluorescence, photoluminescence, thin film thickness measurements, microcolorimetry, for imaging and much more. Microspectrophotometers are used for diverse applications such as colorimetry of pixels on flat panel displays, reflectometry of vitrinite coal and thin film thickness measurements. The spectrophotometer allows the scientist or engineer to acquire spectra of by shining white light on a sample and measuring the light that is returned from the sample. With this non-destructive technique, measurements can be made with light transmitted through the sample, reflected from it or even when the sample is made to emit light by processes such as photoluminescence. The UV-visible-NIR range is especially important as more substances...even colorless ones...absorb in the UV than in the visible and infrared regions. Therefore, a UV -visible-NIR range spectrophotometer is very useful for analysis of most samples for any application. Spectrophotometers are employed in many different fields and are found in both scientific laboratories and production facilities. In the production environment, for example, they are used for quality control of everything from clothing to the emission of light when producing LEDs. Spectrophotometers are used by analytical laboratories to identify and quantify microscopic samples ranging from the kinetics, matching colors, the qualification of gems and minerals, the determination of the color of ink or paint by a process chemist. As such, the spectrometer is a highly flexible instrument with many different applications. 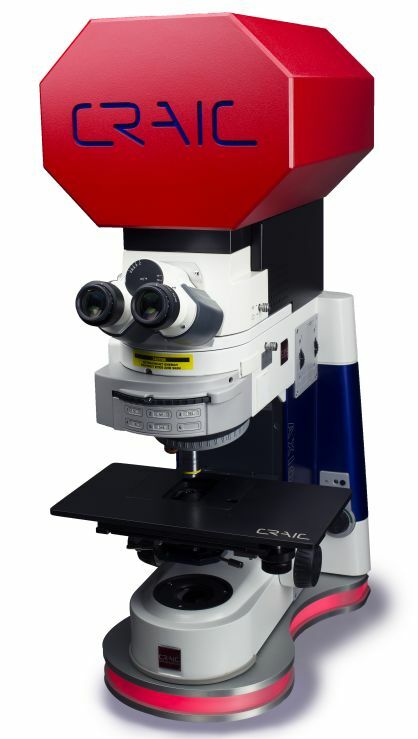 CRAIC Technologies™ specializes in developing superior UV-visible-NIR microanalysis solutions: we build instrument to collect spectra and images of sample features ranging from sub-micron to hundreds of microns. CRAIC Technologies products include UV and NIR microscopes, UV-visible-NIR microspectrophotometers, instruments to measure thin film thickness and colorimetry on the microscopic scale, Raman microspectrometers, automation solutions, traceable standards and more. Applications are numerous: research in materials science, chemistry and physics, forensic science, semiconductor metrology, quality control of optics and flat panel displays, vitrinite coal testing, protein crystals, vision research and much more. Click here to find out more. Why use a UV Microscope? Why use a NIR Microscope? Glass Refractive Index Measurement: rIQ™ is the intelligent way to measure the refractive index of glass and glass-like materials. Universal C-Mount Adapter: An adapter designed to attach cameras and spectrophotometers to a microscope photoport so that they are parfocal and parcentral with the eyepieces. 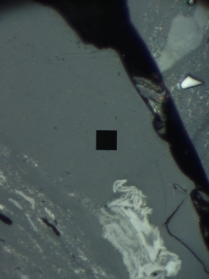 Coal Vitrinite Reflectance: Vitrinite reflectance and fluorescence of coal and coke with CRAIC CoalPro II™. Laser Illumination for Microspectroscopy: Add laser illumination to your CRAIC Technologies microscope or microspectrometer quickly and easily. Featuring alignment mechanisms and capable of working with UV, visible and NIR lasers, the option has applications in many fields. UV-visible-NIR Polarization Microspectroscopy: Both transmission and reflectance polarizers and analyzers are offered for the UV-visible-NIR spectral range. 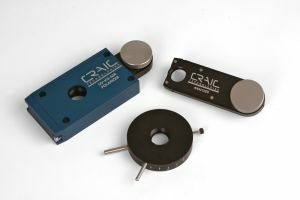 Designed for use with CRAIC Technologies microscopes and microspectrometers, they are housed in both rotating and fixed holders. Microscope Spectrophotometer Standards: Standards designed for use with microspectrometers and traceable to Standard Reference Materials. 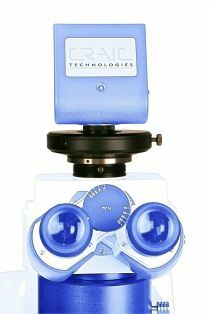 Film Thickness Measurement: Advanced microspot thin film thickness measurement with CRAIC FilmPro™ solutions. Automation Packages: Automate microspectral and image analysis, including film thickness measurements, with the addition of CRAIC Technologies automation solutions. Ideal for industrial applications that require repetitive measurements. CRAIC Technologies provides service and support for it's instruments worldwide. CRAIC Technologies service engineers offer instrument repair, maintenance, training and technical support for all aspects of CRAIC Technologies products. We invite you to discover our revolutionary technologies that include a range of microspectrophotometer, microscope spectrometer, UV microscope, NIR microscope, Raman microspectrometer, Traceable Standards, microscope spectrometer accessories and microscope spectrophotometer software solutions. We further invite you to experience our exceptional service and technical support. 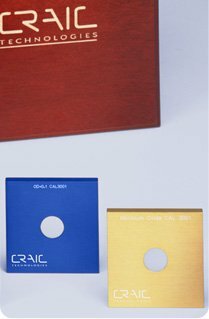 The lit microscope base, the lit square, rectangular, hexagonal and octagonal optical heads are trademarks of CRAIC Technologies, Inc. CRAIC Technologies, Lightblades, Lambdafire, CoalPro, CRAIC ColorPro, CRAIC FilmPro, ImageUV, rIQ and Microspectra are all trademarks of CRAIC Technologies, Inc. Features and specifications depend upon instrument configuration. Specifications subject to change without notice. Thank you for submitting your responses to our survey. We very much appreciate your valuable input. Thank you for contacting our Technical Support Team. We will reply to your request promptly.